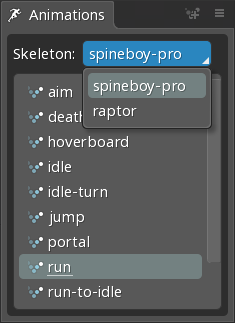 The Animations view provides quick access to a list of the animations for the selected skeleton. This eliminates the need to find the Animations node in the tree just to change the currently active animation. All animations are listed for the currently selected skeleton, just as they appear in the tree. 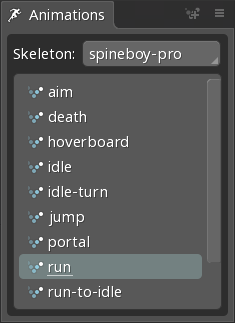 If a project has multiple skeletons, a select box indicates for which skeleton the animations are being shown. Clicking an animation sets it as active. This is identical to clicking the visibility dot for the animation in the tree. Double clicking an animation opens the rename animation dialog. The small icon to the right of the Animations tab creates a new animation.